The website TMZ reported this morning that one of Peterson’s children, a 2-year old son, was in critical condition in Sioux Falls after being beaten by a man who is dating the mother of the child. Peterson’s father, Nelson Peterson, said the child, who lived in Sioux Falls with his mother, was Adrian’s son. Nelson Peterson spoke to the Star Tribune by phone. Vikings coach Leslie Frazier addresses the media this afternoon. Here is the story from the Sioux Falls Argus Leader on the criminal case. 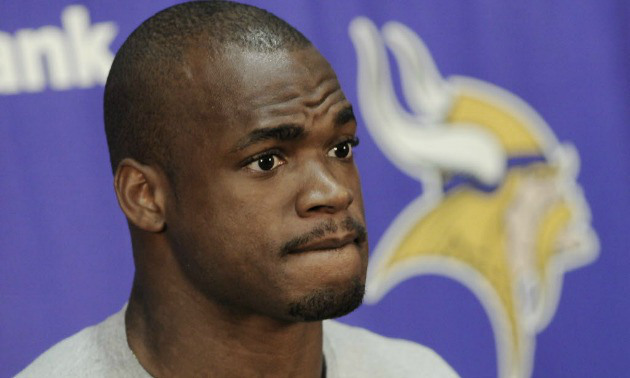 A 2-year-old Sioux Falls boy remains in critical condition this morning, but police aren’t saying if his father is Minnesota Vikings running back Adrian Peterson. Sioux Falls Police Department spokesman Sam Clemens said many people have asked about the identity of the boy’s father. “At this point, we’re not going to confirm anything. Who the father is does not come into play in this investigation, so we’re not going to be releasing any information as far as that goes,” he said. Lincoln County State’s Attorney Tom Wollman asked that people respect the family’s privacy. “The parents and extended family are suffering greatly,” he said. The man accused of assaulting the toddler and leaving him in critical condition in a south Sioux Falls apartment has a history of domestic violence. Joseph Robert Patterson, 27, is charged with aggravated assault and aggravated assault on an infant in Lincoln County for reportedly harming a 2-year-old boy who was in his care. The child was alone in Patterson’s home at Platinum Valley Apartments, where he’d recently moved with his mother. Patterson called 911 to report a choking on Wednesday evening, but Lt. BlaineLarsen of the Sioux Falls Police Department said it became clear at the hospital that the boy’s injuries were not accidental.